My, my, my. It really seems like winter just won’t give up. I haven’t even caught a faint suggestion warmth or fresh breeze yet – you know, the kind that of day that just hints that spring is on its way? My latest fantasies for brilliant sunlight and getting dressed without long underwear, have also included munching fresh, crisp greens, and crunchy vegetables, seldom of which have crossed my lips over the past few months. I really do believe that eating seasonally is one of the most important steps to take towards personal health (read more here), which means choosing more locally-grown fruits and vegetables and preparing them in a way to support the body’s needs. This practice is something we’ve long forgotten about since asparagus entered the grocery store in January. However it is possible to eat well according to the season, and still have lots of flavour and variety. So I declare the month of February…Warm Salad Month! I know it’s hard to forgo the beauty of raw salads this time of year, but it puts stress on the system when we are cold and when we consume cold foods. Makes sense, right? I think so. The first salad I am featuring is a classic combo of fennel and orange, with a twist. 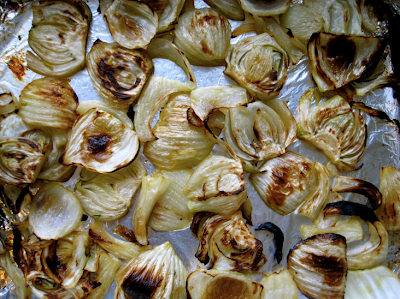 Instead of eating the fennel raw, I chose to roast it, caramelizing the natural sugars, and bringing out an entirely new flavour. It is SO delicious!! Fennel is like the perfect combination of crisp, crunchy celery and sweet licorice. It is not the most common vegetable in North American cuisine, but surprisingly available at most grocery stores and markets. 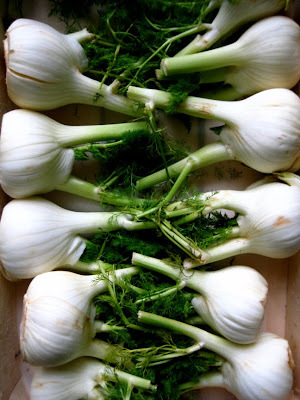 You can certainly eat the bulb raw (when the weather warms up, of course) as well as the feathery fronds that resemble dill weed – they make a nice garnish and add great flavour. Fennel is high in vitamin C and A. It is a great source of dietary fiber, and as such may help to reduce elevated cholesterol levels. And since fiber also removes potentially carcinogenic toxins from the colon, fennel bulb may also be useful in preventing colon cancer (1). Fennel is also high in potassium, manganese, and folate. As a side note, I came across this great website recently which shows you which foods are in season at what time of year. It’s a very easy to use reference that can keep you informed every month! Here is the link for fennel, but browse around to find exactly what you’re looking for. This is another one of your magic salads. It is so tasty and so surprising to the palate at the same time. This is the best kind of food on a hot summer’s day. Thank you. From the South West of France. We LOVE this recipe and cannot wait to try it! We included it in our Fennel Friday Fennel Frenzy roundup! Happy Fennel Friday! I am sitting eating this salad right now and it’s really really tasty! I generally don’t care for fennel, but one showed up in my CSA share this week and I remembered seeing this recipe. I’m so glad I did! This is something that I would never have tried unless I was ‘pushed’ to do so. Honestly, the flavors and textures are perfect! Well done Sarah and thank you so much for another fantastic recipe! I really love your blog. It’s helped me in so many ways but mostly your sharing simply scrumptious recipes that helped me (and my family) transition from a vegetarian diet to a totally plant based diet and I love it! I am truly thankful for all your insight, hard work and amazing talent. Thank you, thank you, thank you! This salad looks tasty. I NEVER would have thought to combine those flavors.